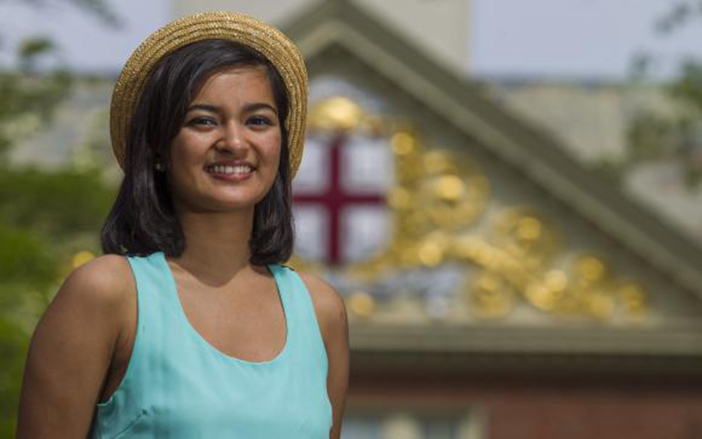 Halfway through her undergraduate studies at Brown University and not quite done with her teens, Soumitri Barua ’17 MD’21 is the lead author of a study in the Annals of Internal Medicine that raises troubling questions about how states have responded to the hepatitis C epidemic. New medicines can cure the infectious liver disease, but at a cost of roughly $90,000. Analysis by Barua and her co-authors shows that in 2013, caught between the cost and the need, most Medicaid programs across the country rationed the treatment sofosbuvir. “My job was to figure out the rationing policies in every state,” Barua said. The research revealed that 88 percent of the 42 Medicaid programs with policies online imposed restrictions based on patient drug or alcohol use. Three-quarters of states reserved treatment only for those with the most advanced liver disease. Two-thirds of states limited who could prescribe the medicine and about a quarter of states required patients co-infected with HIV to be on HIV therapy or have suppressed HIV virus levels. Some states employed multiple strategies. Taylor recalled telling Barua, “This is not for the faint of heart.” All the more reason that Taylor admires Barua’s work. Barua read everything Taylor gave her to learn the medical and public health background. She dug deeply into each state Medicaid program’s website to ferret out the policies. (Second author Robert Greenwald, JD, a Harvard law researcher, did the same in parallel so their findings could later be cross-checked). Taylor’s team could have released the data quickly, sidestepping the peer review process, but she wanted it to be ironclad and published. That meant the research carried over into the whole next school year. Barua stuck with it all the way, helping to win acceptance for the paper—responding to editors’ queries, working on new drafts for submission, creating charts, and gathering references. Barua has been interested in studying medicine since she took biology in high school in her hometown of Olean, NY. She was especially intrigued by how infectious diseases work in the body and how they spread. The broader interest in medicine motivated her to volunteer to help with breast cancer research in the lab of Julie Hens, PhD, formerly at St. Bonaventure University in Olean, about 74 miles south of Buffalo. But Barua was interested in more than just science. She volunteered in high school for service advocacy projects. She learned knitting to make hats for local babies. She led a book drive that gathered more than 2,000 texts for children overseas to promote global literacy. She helped to stage fundraisers for a local homeless shelter. With these efforts she earned a 2013 Zonta International Young Women in Public Affairs Award. All the while, she had her sights set on Brown, where she could study medicine without having to miss out on a broad college education. For example, while the rising junior is concentrating in public health, she also completed her fourth semester of Chinese in May. Barua connected with Taylor in her freshman year, when she decided to use the upcoming summer to gain research experience in infectious disease. She had seen a paper by Susan Cu-Uvin, MD, professor of medicine, and emailed about an internship. Cu-Uvin shared her name with Taylor, a co-author on that study, who needed an extra research hand. Taylor and Barua raced to apply for summer scholarship funding through the Lifespan/Tufts/Brown Center for AIDS Research. Barua didn’t realize how much it would amount to. “At that time I didn’t anticipate that our project with Dr. Taylor would culminate in a paper, but I’m glad it did because the world deserves to know about the unfair heterogeneity of sofosbuvir Medicaid policies,” Barua said. The project cost Barua a bit of political innocence, but she said she hopes it will help. The research may have been “eye opening,” she said, but not discouraging. Barua called Taylor “an awesome mentor” and the two continue to work together. Their current project is to promote hepatitis C screening with the Lifespan health system’s new electronic medical records system, EPIC. The system prompts physicians to screen baby boomers for hepatitis C. But Taylor wants to make sure doctors understand the importance of the prompt and what to do with a positive result. She and Barua want to learn best practices of other health systems and to disseminate what they learn. “I’m sure we’re going to see a lot more from Soumitri,” Taylor said—even if the 19-year-old is still six years away from earning her MD at Brown.